It's a contemporary set that's just a bit different from the rest. 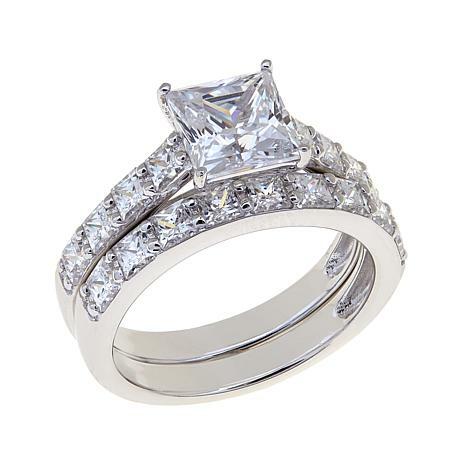 The princess-cut stones, in the solitaire as well as the band, give this set a high-end look. Together, they dazzle day or night. I just received this ring in the mail...it is ABSOLUTELY GORGEOUS! It looks so much better in person. 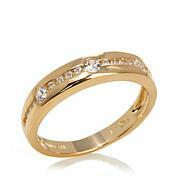 It is perfect to use as a 2nd ring for vacation, etc. I was very skeptical about buying jewelry online but now I am so glad I did. 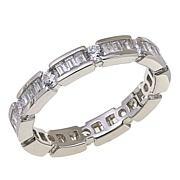 I would buy this ring or another again without hesitation. I lost my wedding set recently, but still hopeful I will find it one of these days. In the meantime, I wanted something to wear without breaking the bank. This set is very believable. It is very pretty and I am happy with the purchase. totally believeable! I am returning the cushon set I ordered, because for me, the main stone was to big. That set is breathtaking, but I just wasn't completely happy with it. 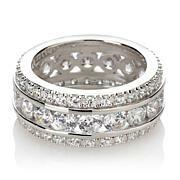 This ring set, for me, is perfect. 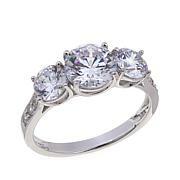 The main stone isn't too big, the sparkle is blinding, and, in my opinion, the main center stone is a perfect size. The surrounding stones also give off lots of sparkle. It's comfortable, and is a good fit. I have finally found the perfect ring set. It looks real and is just beautiful! My real wedding ring recently got damaged and I couldn't wear it so I was wanting to get something to wear until I can take it to the jeweler to get it fixed. I decided I'd try this set and I was so pleasantly surprised! It arrived today and is absolutely beautiful! Very believable size too. So happy I took a chance and got this. I highly recommend! I liked the set, its beautiful and sparkly. However I did send it back. It didnt really have the wow factor I was looking for. If the center stone was larger I probably would have kept it.